FILE - President Donald Trump speaks during a news conference with Baltic leaders in the East Room of the White House, Apr. 3, 2018, in Washington. On Sunday, Trump blamed Russian President Vladimir Putin and Iran for a "mindless chemical attack" in Syria. This photo released by the Syrian Civil Defense White Helmets, which has been authenticated based on its contents and other AP reporting, shows smoke rising after Syrian government airstrikes hit in the town of Douma, in the eastern Ghouta region, east of Damascus, Syria, Saturday, April. 7, 2018. 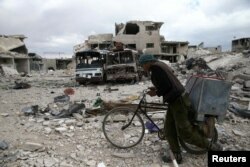 FILE - A man walks with his bicycle at a damaged site in the besieged town of Douma, Eastern Ghouta, near Damascus, Syria, March 30, 2018.